After completing the PhotoReading program several months ago, I’ve been evaluating some of Learning Strategies’ other products. One in particular that really impressed me was their Paraliminals collection. This is a set of meditation/relaxation audios embedded with Holosync technology. Holosync employs what are called binaural beats, which use different sound frequencies to coax your brain into a state of deep relaxation. I’d never previously tried any Holosync programs, although many people have been encouraging me to check them out. I found these audios extremely effective. They make it virtually effortless to enter deep meditative states. I’ve used them for over three months now and have experienced compelling benefits. 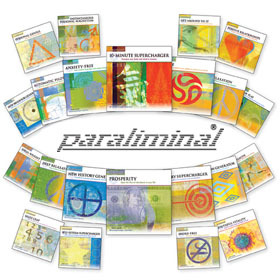 The Paraliminals are themed with various self-improvement topics, with each session being about 20 minutes long. The themes include overcoming procrastination, losing weight, improving your communication skills, and so on. The whole collection, called the Ultimate You Library, includes dozens of individual Paraliminals, so it’s extensive. I have the whole library and have listened to all but two of them so far, most of them multiple times. Even though the name sounds like “subliminals,” Paraliminals are a completely different animal. There are no hidden subliminal messages. What’s unique about Paraliminals is that you actually hear a different voice in each ear. That might sound strange — or even overwhelming — but the way it’s implemented is pleasantly relaxing. I own a lot of meditation programs, and I’ve been meditating regularly for about 15 years. I’ve also listened to a number of subliminal audio programs and found them generally worthless. Consequently, I wasn’t expecting to be much impressed by Paraliminals, figuring it would just be more of the same. However, I have to say these audios really shine, especially when compared to the rest of my collection. I think Paraliminals would be especially great for people who are new to meditating or who have trouble achieving the right states because the binaural beats take you there passively. I wouldn’t say Paraliminals are a substitute for other forms of meditation, but their strength is their consistency. Without fail they have always guided me into a deep meditative state, even under less than ideal conditions. Based on my experience with Paraliminals, I’m able to give them a very strong recommendation. Because I know this website’s audience loves details, I put together a comprehensive page about Paraliminals and their benefits. Although they’re no substitute for hard work, Paraliminals are an effective performance enhancer. After listening to my first Paraliminal session in August, I’m still listening to them regularly. My last session was about two hours ago. Check out the Paraliminals page for all the details.